This blog has met the Irish everywhere. From Britain to Australia, from all parts of Europe, to the USA, from the Middle East to South Africa. Some have been first generation. Others have been the sons and daughters of previous generations forced from Ireland for economic and social and political reasons. Persecution, sectarianism, repression, hunger all played their part. Among the 70 plus million in the Irish diaspora scattered around the globe there are many who take a deep interest in developments in Ireland. They seek to play a helpful role. Many times this is in small personal ways. Over recent decades they have positively contributed to the search for peace. This has been especially true of the Irish in America, Britain and Australia. Friends of Sinn Féin in America was established in 1995. It raises funds for the party. It has done sterling work in that time. Consequently leading Shinners have travelled to all corners of the USA speaking at breakfast, brunch and dinner fundraisers and at many universities. We have addressed press conferences, met newspaper editorial boards, lobby groups and politicians at local, state and federal level, as well as the various Washington administrations under Clinton, Bush and Obama. We have also engaged with local Irish American communities and briefed them on the ongoing developments in the peace process. In my travels around the USA I have met tens of thousands of very good, decent Irish Americans. Frequently, in the early days of my travels I would be met at airports by Irish American police officers who would whizz me around New York and other cities, through rush hour traffic, with lights flashing and sirens blaring. I used to joke that it was for me a whole new experience of being driven round by police officers who weren’t intent on taking me to prison. In New York the backbone of the fundraising project for FOSF is the construction industry, and the police and fire services. Others, including people who work in the financial district, the law, the pub and restaurant business, in community organisations and ordinary working men and women, have also been enormously helpful. A frequent attender at our fundraisers was Fr. Mychal Judge, a Franciscan priest, who was well known in New York for his work among the homeless and aids victims. Mychal was chaplain to New York’s Firefighters. He was also close friend of Steven McDonald, a New York policeman now a quadriplegic, as a result of being shot. Steven is a strong opponent of violence and a firm believer in forgiveness. Mychal and Steven both attended some of our New York events. They even travelled to Ireland and Parliament Buildings at Stormont to see the changes that their support for the peace process had helped bring about. In 1999 I visited the Mercantile Exchange, the largest commodity futures exchange in the world, and then in the shadow of the twin towers. A group of FOSF activists, Todd, Fitzy and Tom arranged for me to see the place and watch the madness of the ‘bear pit,’ There scores of traders, buying and selling commodities, line 10 or more deep shouting at each other creating a cacophony of noise and excitement. How they understand what they were buying and selling is beyond me. These three also organised a very successful fundraiser in the north tower of the World Trade Centre in the Windows on the World restaurant. The restaurant was at the top of the tower, on the 107th floor. I remember looking out of the large windows. It was like being in a helicopter hovering high above New York. It was a spectacular panoramic view of New York and New Jersey, of the Hudson River, and the Statue of Liberty, and of Ellis island through which so many tens of thousands of Irish immigrants had entered the United States. There were about 30 people there that day. Enjoying the craic, getting photos taken and talking about Ireland. Being captivated by Rita O Hare. We also met security men and women, waiters, lift operators, and others. They were all warm decent human beings. Two years later the twin towers were gone and almost 3000 people were dead. 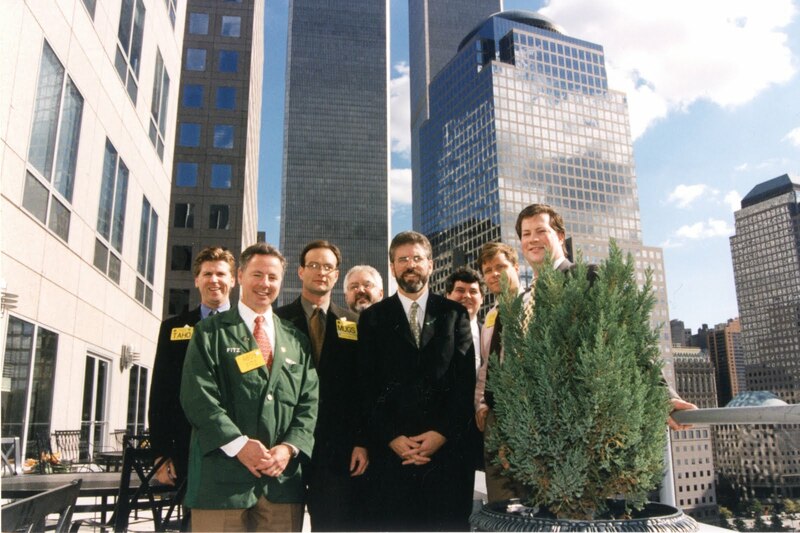 Among them was Tom (McGinnis) one of the three who had organised our World Trade Centre event. Another to die was Mychal Judge. Hundreds of New York police officers and NYFD personnel died also, along with construction workers, many from Ireland. I remember that day. 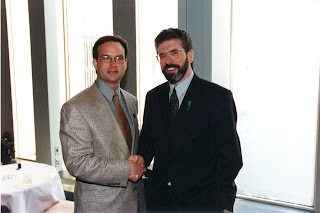 Martin McGuinness and I had been meeting the Taoiseach in government buildings in Dublin. As we left the building we met US Special Envoy Richard Haas. The first reports were coming in but the detail was vague. Mark Costigan, a very good radio journalist was outside Government Buildings with the press pack. He had a new hi tech electronic gadget with a miniature TV. We heard him exclaiming and gathered around him to watch images of the planes hitting the Twin Towers. It was like a scene from a film. Hard to take in. Then on the way north we listened on the car radio to Conor O Cleary’s eye witness account of what was happening. It was gripping and shocking and terrifying. I immediately began to ring friends in New York trying to find out if any of those we knew were among the dead or injured. Like many others I spent several hours each day for several days doing this as the extent of the devastation and the scale of the deaths became clearer. Two months later FOSF held its annual fundraising dinner in New York. It was agreed that the monies raised would go to help the families of the construction industry who were killed at the World Trade Centre. It was a small gesture of solidarity from Irish republicans in Ireland, and from Friends of Sinn Fein in the USA, to our friends in the construction industry who suffered grievously as a consequence of the attacks that autumn day in September 2001. During that visit I called to a local Fire Station. The fire fighters talk with huge pride of their chaplain Mychal Judge. He had joined them in the inferno that was the Twin Towers. He died attending to them and the dead and injured. The Fire Fighters had a deep sense of gratitude to him. There was also a deep sense of the huge courage and heroism of all those who rushed to help others caught up in the attacks in New York and Washington and the passengers of Flight 93 who confronted their hijackers. September 11 is one of those watershed moments in human history. Its consequences are still with us today in Iraq and Afghanistan and elsewhere. But on this tenth anniversary our thoughts and prayers are with the innocent who died. On Sunday I thought back on all this. I also thought of the time I visited Arlington cemetery with Courtney Kennedy, Robert Kennedy’s daughter. She brought us to visit her father and her uncle’s graves. Carved on the wall before Robert Kennedy’s grave are words he spoke in South Africa in the 1960s – visionary words in the history of that troubled land but words which speak to those who died trying to help their neighbours in the 9 /11 attacks or the 70 million Irish people throughout the world who make up our great diaspora and whose help and support we still need as we seek to advance our democratic goals of peace and unity and freedom for Ireland. Encouraging is your words, to see that past events with more clear vision in time. Robert Kennedy also wrote "Progress is a nice word. But change is its motivator. And change has its enemies." he could have been talking about the Peace Process as well. Good words Gerry, thanks once again.